This map from carto.metro.free.fr shows the route of Crossrail through Docklands. Cossrail is shown in a blue-purple colour and it goes horizonrally across the map. The Crossrail stations in the area are as follows from West to East. Whitechapel station is off the map to the west. I have included it, as it will be Crossrail’s Jewel In The East and the most important interchange for the line in East London. It links both eastern branches of Crossrail to the Metropolitan and District Lines. It provides an interchange to London’s important but sometimes forgotten East London Line. An extended Whitechapel station would provide much better access to the East of the City of London. But perhaps more importantly, Whitechapel is the reversal station for passengers travelling between one Eastern branch of Crossrail and the other. Canary Wharf station is Lord Foster’s architectural set piece for the line, which is probably more about showing off, shopping and leisure, than transport. I have my worries about this station, in that interchange between Crossrail and the Jubilee Line and the DLR, may turn out to be long walks interspersed with a couple of long escalators. I also think that many passengers for Canary Wharf will prefer to come to the area on the light and airy Docklands Light Railway, rather than on a deep, dark line with no views. Cinderella always comes out on top, as that’s where she belongs. But then this station wasn’t designed for the needs of normal passengers. I think that when Trip Advisor and other sites, start to rate Crossrail that this station will not be liked, except by those who live and work in the area. Custom House station is being built primarily to serve the Excel Exhibition Centre and the surrounding area. Silvertown station is not planned, but the site has been safeguarded, so that it can be built when required. I think it will be built in the next few years. It would link Crossrail to the London City Airport. It would give London City Airport a direct connection to Heathrow and a one-change connection to Gatwick. It would link Crossrail to the Southern branches of the DLR. Hopefully connections would be better than at Canary Wharf. But the building of this station, will be mainly driven by the developments to the south of the Royal Docks. 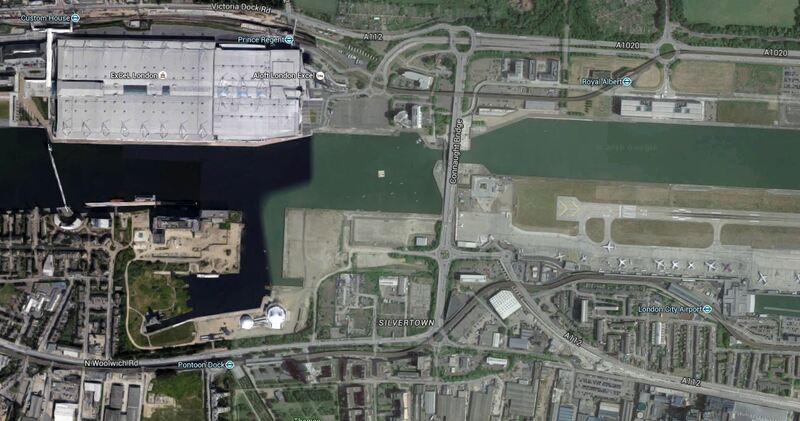 This is a Google Map of the area, which shows the North and South entrances to the Connaught Tunnel, which takes Crossrail under the Docks. This second Google Map, shows the Southern entrance to the Tunnel in detail. 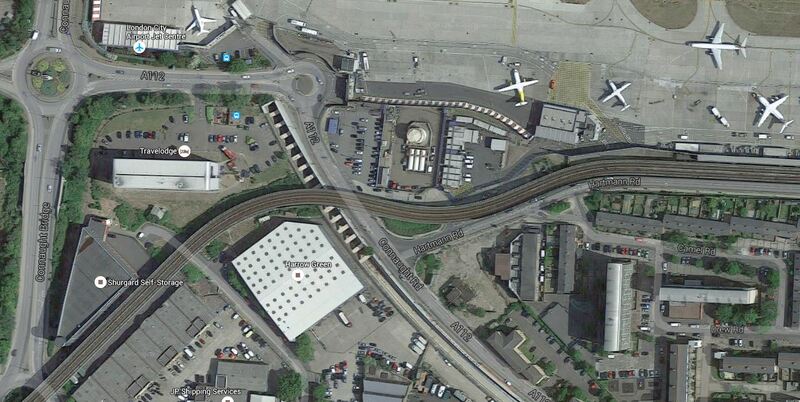 The proposed Silvertown station would be in this area. As to the precise location, I can’t find any information. Woolwich station is to the east of Docklands on the South bank of the Thames. It has been built solely to serve the new housing on the Royal Arsenal site and has very poor connectivity with other rail lines. Note Woolwich Arsenal station and the co-located DLR connection to the South West of the map. Woolwich station is somewhere underneath the blocks to the North. There is certainly a need to create a decent walking route in the area. Looking at these stations, it strikes me that although connectivity between Crossrail and other lines is there, it is not of the best at some stations. Scoring them out of ten, I would give scores as follows. Obviously, when the line opens, good design may improve matters. But I do feel that building Silvertown station would make the whole line a lot better. Crossrail’s connection to the DLR at Canary Wharf could be excellent if they give it a good, easy link to Poplar station. I think that the plan is to do this, I’ll be interested to see what it’s like when the trains start running. I agree and that’s why I said good design may improve matters. But if they do a cheapee, it could be another Kings Cross or Bond Street with a long boring walk. At worst they’ll hopefully just extend the existing footbridge, which I think has always been the plan for that footbridge. Looking down on the Aspen Way should never be as boring as being in the bowels of King’s Cross. As is standard for Canary Wharf it will be interesting to see how the maps show the connections between the stations. Will there just be one huge blob at Canary Wharf on the tube map for all of the 6 separate stations (4x DLR, 1x JLE 1x Xrail) at the interchange. I have a feeling that the levels at Canary Wharf could be difficult, so getting decent connections could involve lots of stairs. I think we’ll see what is planned in the next couple of years! But I do think there will be some tricky little journeys when Crossrail opens.